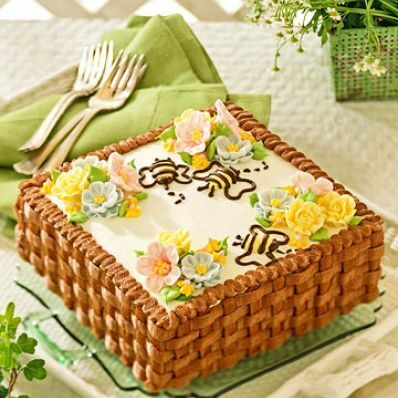 Decorate this two-layer cake to look like a flower basket. The sides are frosted in the basket-weave pattern with chocolate frosting. Add as many frosting flowers as you like to the top. 1 of 5 Heat oven to 350 degrees F. Coat two 8 x 8 x 2-inch square cake pans with cooking spray. Line bottoms with parchment or waxed paper. Coat paper with spray. 2 of 5 Whisk flour, baking powder and salt in large bowl. 3 of 5 On medium speed, beat butter in large bowl until creamy, 1 minute. Add sugar; beat until fluffy, 2 minutes. Add eggs, one at a time, beating after each. Beat in vanilla. 4 of 5 On low speed, beat flour mixture into butter mixture in 3 additions, alternating with milk, ending with flour. Beat on medium speed 2 minutes. Divide batter equally between prepared cake pans. 5 of 5 Bake in 350 degrees F oven 25 minutes or until pick inserted in centers comes out clean. Cool cakes in pans on racks 10 minutes. Turn out onto racks; remove paper; let cool. 1 of 1 1. Beat butter and shortening in large bowl 1 minute. Add sugar, milk and vanilla; beat on low speed until blended. Beat on medium-high 1 minute. Remove 3/4 cup frosting to small bowl; cover with plastic wrap. 2.On low, beat melted chocolate into larger amount of butter mixture until smooth. Add additional milk if needed for good spreading consistency. Cover with plastic wrap. 1 of 1 1. Place one cake layer on cake plate. Spread 1/2 cup chocolate frosting over top. Place second layer on top of first. Spread reserved white vanilla frosting over top. Using 3/4 cup chocolate frosting, spread thin layer over sides of cake. 2. Fit pastry bag with coupler and #47 basketweave tip. Fill bag halfway with chocolate frosting. Cover sides of cake with basketweave pattern. Refill bag as needed. 3. With same pastry bag, make zig-zag pattern around top edge of cake where chocolate frosting meets white frosting. 4. Decorate top with flowers and leaves. Use frosting as glue. 5. Press almonds onto top of cake. Fit pastry bag that contains chocolate frosting with small writing tip. Draw outline of bumblebee over almonds, using almond as bees body. Refrigerate cake 1 hour to set.